Background: Physical activity is an integral part of a healthy lifestyle. There are multiple barriers to exercise in the modern world. This combined with poor dietary behavior is a principle driver of obesity. Given the prevalence of mobile technology, especially among young adults, public health initiatives utilising fitness applications on smartphones offer an exciting new frontier in tackling this problem. However, there is a lack of evidence regarding the effectiveness of this mobile technology as a substitute to other exercise modalities. Methods: In this pilot study, a search was performed using the Apple 4S smartphone’s “App Store” for relevant fitness applications (‘apps’). Three apps were found to fulfill the inclusion and exclusion criteria of the study: Nike Training Club, Instant Fitness and Gorilla Workout Free. Exercise was then performed as per each app’s guidance, and caloric expenditure was measured using a validated device. This caloric expenditure was then compared with the control exercises, which included slow-speed jogging, WiiFit Plus exercises, and RPM, an indoor gym cycling program. One subject performed three trials of each exercise modality. Results: Jogging was the best form of exercise in regards to caloric expenditure (mean 7.9 calories/min), and was superior to all other groups. Nike Training Club was superior to Gorilla Workout Free app, however, there were no other significant differences between the apps. 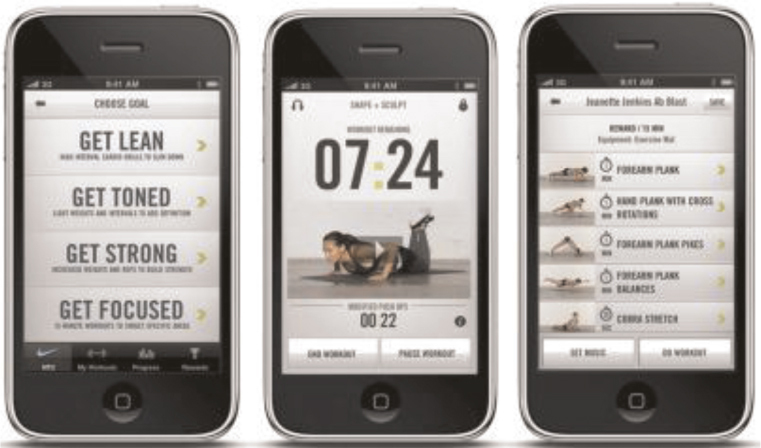 Nike Training Club and Instant Fitness apps were as effective as RPM and WiiFit Plus groups. Conclusion: This pilot study showed that fitness apps are as effective as a gym cycling group class with regards to caloric expenditure per unit of time. They offer a new paradigm for exercise for individuals with barriers to participating in organised fitness activity. Smartphone technology has the potential to be utilised as a new tool for public health initiatives to tackle the growing obesity epidemic. Being physically active improves mental and musculoskeletal heath and reduces other risk factors such as obesity, hypertension and hyperlipidemia. Thirty minutes of moderate intensity activity daily, preferably all days of the week has been recommended for limiting health risks for a number of chronic diseases including cardiovascular disease, colon and breast cancers, type 2 diabetes and osteoporosis1. However in 2011, 48% of adults aged 18 and over in America did not meet the physical activity guidelines2. Sixty five per cent of the world’s population live in a country where being overweight or obese causes more deaths than being underweight. Worldwide, more than 1 billion people are estimated to be overweight (body mass index [BMI] >25kg/m2), and more than 300 million of these are considered obese (BMI >30kg/m2), making obesity one of the greatest threats to public health today3. In Western Australia, high BMI has over-taken tobacco as the leading independent risk factor contributing to disease4. Although the causes of obesity are multifactorial, a number of important lifestyle risk factors have been associated with weight gain during young adulthood; namely, a decline in physical activity, an increase in sedentary behavior, frequent consumption of fast-food and sugar-sweetened beverages, as well as higher total energy and fat intakes5. In Australia, one in four people aged 12 to 24 years is currently overweight or obese6. Given obesity is a risk factor for various chronic conditions including diabetes, hypertension, hyperlipidemia, stroke, heart disease and certain cancers it should be an imperative focus of public health interventions7. The burgeoning fitness industry is one such avenue for tackling obesity and to promote healthy lifestyle including physical activity. Over 4 million Australians participate in fitness industry activities. Users typically include young adults, in the age range of 25 to 34 years, with higher rates of female to male participation. In 2012, the fitness industry had revenues of over $1.2 billion, and contributed $1.4 billion to Australia’s GDP8. Aerobics, fitness and gym activities are now the second most popular forms of exercise. Furthermore, growth in the fitness industry in comparison to the broader industry of sport and recreation has been growing at a faster rate in employment, revenue and value adding. Moreover, programs in the popular media, such as the television series ‘the Biggest Loser’ have promoted fitness activities. Although the fitness industry is expanding, there are barriers for overweight or obese individuals to participate in fitness activities. The main barriers to exercise in overweight individuals were primarily due to negative attitudes regarding exercising around younger or fitter individuals. Both normal weight and overweight individuals had the exact same intent to exercise and held similar attitudes regarding gym equipment, however their perceptions limit participation9. Other reasons that people do not join a gym include cost, lack of time, inconvenience or feeling out of place10,11. Perceived neighborhood safety and neighborhood walkability have been identified as barriers to physical activity outside of a gym setting; furthermore, these factors have a positive association with sedentary behaviors, such as television viewing12. Mobile technology offers a possible alternative to tackle this problem. Across the developed world, the average person own 1.1813 mobile phone subscriptions with this number continuing to rise. The growth in the use of mobile phones with sophisticated processing capabilities and functionality (i.e. smartphones) has been concentrated in young adults, especially those at risk of becoming overweight or obese. In the United States, 62% of mobile phone users aged 25 to 34 owned a smartphone in 2011, which is an increase from 41% in 201013. Similar patterns are evident in Australia, where 92% of Australians over the age of 18 years using a mobile phone, of which 49% use smartphones14. Mobile phones are a particularly attractive avenue for delivering health interventions because of: (1) the widespread adoption of phones with increasingly powerful technical capabilities, (2) people’s tendency to carry their phones with them everywhere and (3) context awareness features enabled through sensing and phone-based personal information15. Mobile technology provides an opportunity to develop interventions with lower costs, less burden, and a greater reach, particularly as mobile usage continue to rise. Smartphones have the ability to extend key components of intensive weight loss treatment into real-world settings16. Mobile phone applications (‘apps’) aimed at encouraging and enhancing physical activity are entering the smartphone marketplace. The aim of this pilot study is to assess these ‘fitness apps’, especially in regards to their efficacy as a tool for physical exercise. If they are a suitable alternative, mobile technology could provide another tool in the armamentarium of healthcare professionals in tackling the barriers to physical activity and promoting healthier lifestyles. The program should be free of charge indefinitely after download. Applications with a free trial period of finite length were not included. The program should have full and efficient functionality after downloading, without additional software download being necessary. The fitness activity should not require any additional equipment (e.g. weights). Nike Training Club (Nike Inc) offers more than 85 custom-built workouts with instructional videos and audio support, and functionalities such as the ability to set music, share progress and earn rewards (Figure 3). For this study, the ‘sweat + shape’ workout was used. Instant Fitness (Azumio Inc) offers 120 tailored workouts based on more than 600 exercises, specifically designed to be performed at home (Figure 4). The ‘lean and mean (medium)’ workout was utilised for this study. 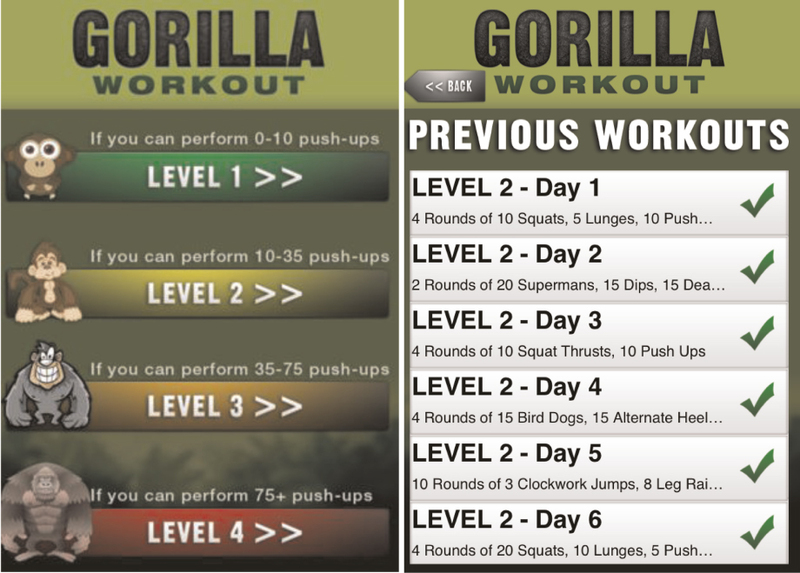 Gorilla Workout Free (Heckr LLC) offers daily body-weight only workouts based on a grouping of 19 exercises that combine cardio and strength training. 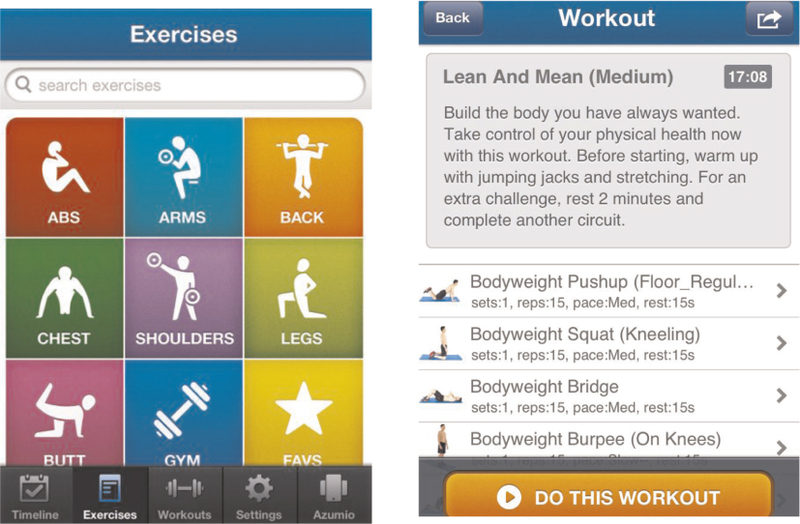 The app includes instructional videos and text, 4 fitness levels and day-by-day fitness regimens. Further functionalities include sharing progress via social media (Figure 5). Day 1 and 2 workouts for level 1 were utilised for this study. Three 30 minute trials were performed on the apps selected. 30 minutes was chosen as it is the minimum recommended1, and is likely what time poor individuals may be able to commit. The control exercises included other common exercise modalities: a slow-speed jog, exercise session using WiiFit Plus (Nintendo Corporation, Kyoto, Japan), and an indoor cycling program at the gym (RPM, Les Mills International). Three 30 minute trials were performed on with slow-speed jogging and WiiFit Plus. RPM was only available as a 45–50 minute session, hence the caloric expenditure per minute was calculated for all the exercise groups to enable comparison. A single subject (the principle author) performed all the trials: the subject was a 28-year old, 171cm, 75kg male with average fitness. There was no blinding or randomisation. In regards to the control exercises, the slow-speed jog involved a 4km, approximately 30 minute jog at a comfortable speed (about 8–9km/h) with short interspersed walking periods as tolerated by the study subject. WiiFit Plus (Figure 1) utilises Wii Balance Board, which measures motion, balance and weight with internal scales and pressure-sensitive points, with the popular Nintendo Wii console to enable workout exercises with mini-games designed to keep the player interested in working out. The 30 minute trials in the study included aerobics exercises (free run, hula hoop and basic step), and strength exercises (push-ups, planks, lunges and leg extensions). RPM™ is an indoor moderate to high intensity 45 to 50-minute cycling workout where you ride to the rhythm of music in a group gym class. The primary outcome measure of this pilot study was calories consumed per minute with each exercise modality. The secondary outcome was metabolic equivalent of task (METS) score for each activity. To measure these, the study utilised the Bodymedia FIT LINK Armband (Bodymedia Inc, Pittsburgh, PA- Figure 2). The Bodymedia FIT LINK Armband is worn on the upper left arm over the triceps muscle at around the midpoint between the acromion and olecranon. It collects a variety of physiologic data through multiple sensors (a two-axis accelerometer, heat flux sensor, skin temperature sensor, near-body ambient temperature sensor, and galvanic skin response sensor) that can be uploaded and analysed using smartphone or computer software. These physiologic data enable the armband to detect and measure physical activity of the lower and upper body to detect the change in energy expenditure associated with load carrying, change of grade and non-ambulatory physical activity. It is designed as an encompassing tool for weight-loss that enables the consumer to detect calories burned during day-to-day activities and exercise, as well as the ability to input data for calorie consumption, sleep etc. In the clinical setting, multiple studies have shown that the armband provides valid and reliable estimates of energy expenditure17–22), although one study showed that it overestimates energy expenditure during flat walking and underestimates energy expenditure during inclined walking23. Statistical analysis was performed using the computer software GraphPad Prism 6 (GraphPad Software Inc, La Jolla, CA). Mean and standard deviations were calculated for each modality with the three trials. A one-way ANOVA with post hoc multiple comparisons was performed to assess for differences between the different modalities. Paired t-test was performed to assess differences between each app and each trial. A significance value of <0.05 was considered statistically significant. Figure 6 and 7 illustrates the mean and standard deviations of the calories burned and average METS respectively, of each of the study groups. Jogging resulted in the highest caloric expenditure between the exercise modalities, with a mean (M) of 7.9 calories per minute. The three fitness apps were somewhat even, with Nike Training Club being the most effective at mean 5.32 calories per minute. 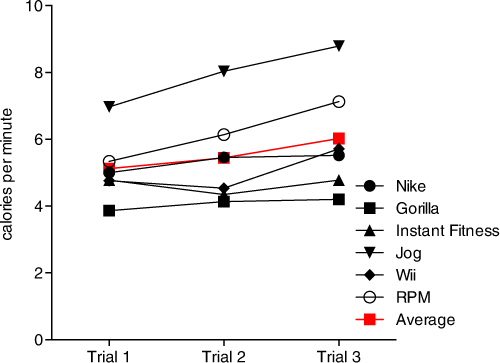 Nike Training Club (M = 5.32; standard deviation (SD) = 0.28) was superior to Gorilla Workout Free (M = 4.06; SD = 0.18) (t(3) = 1.257; p = 0.002; 95% CI 1.00 – 1.52), however, there were no significant differences between Instant Fitness and Gorilla Workout Free, or between Nike Training Club and Instant Fitness. 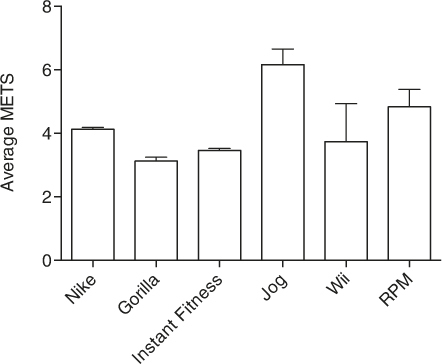 Jogging was superior to all of the other groups in regards to calories burned per minute, as shown by one-way ANOVA with post hoc multiple comparisons (Table 2). 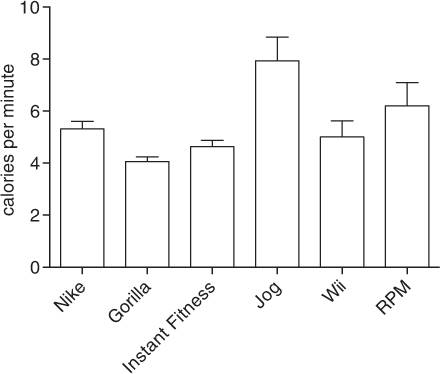 RPM was superior to Gorilla Workout Free, but not the other two apps. The findings were unchanged when compared with average METS data. An incidental finding was noted that on each group, calories burned per minute increased as the trials progressed: i.e. with repetition the calories consumed for each modality improved (Figure 8). There was a significant difference between trials 1 (M = 5.12; SD = 0.94) and 3 (M = 6.02; SD = 1.53) (t(7) = 0.90; p = 0.01; 95% CI 0.26–1.55), and trials 2 (M = 5.44; SD = 1.35) and 3 (t(7) = 0.58; p = 0.01; 95% CI 0.18–0.98). No statistically significant difference was noted between trials 1 and 2. Figure 8 highlights this trend noted in the study. The author believes that this is the first study of its kind comparing fitness apps effectiveness versus other exercise modalities. Apart from being efficacious, apps have the added benefit of being convenient, being able to perform physical activity ‘on the go’ or with limited time. We studied only free apps to ensure generalisability, and for the consumer there is a significant cost benefit, when compared to a visit to the gym which costs about $15 per session in Australia. This study highlights for 30 minutes of exercise, that fitness apps result in a reasonable caloric expenditure when compared to a gym program. This could potentially provide an avenue for using mobile technology as part of a broader context, of a weight-loss and healthy lifestyle program: fitness apps could be used as part of public health programs that involve healthy dietary habits, exercise and sustainable weight loss. In itself, fitness apps may provide an alternative to combat the barriers for physical activity highlighted in the introduction, such as lack of time, inconvenience, and feeling out of place in a gym environment. Products, such as the Bodymedia armband also have a role in this setting to give the user control of their treatment and progress. Instant feedback, such as the caloric expenditure provides a good impetus to improve physical activity. One of the most difficult aspects of promoting physical activity as part of a public health campaign is developing lasting behavioral change. There are complex factors at play to establish behavioral change, and enjoyment of the activity is a part of this24. All forms of the electronic exercise modalities have different methods to enhance enjoyment in exercise. Nike Training Club app offers different medals when the user reaches certain milestones and has voice encouragements. Subjectively the author feels that the Nike Training Club app was superior, in regards to engaging the user in physical activity. WiiFit Plus also promotes enjoyment and positive feedback with giving voice encouragement during exercise, and exercise in the form of simple games promotes engagement in the activity. In this sense, the author felt more engaged with activity using the mobile phone apps or the Wii Fit. However, this may be a reflection of generational change, whereby young adults are more likely to adopt technology: 94% of 18 to 29 year olds use the internet in America, compared to 47% of all adults25. Automated tracking, ability to track progress towards goals, integrated music features, flexibility, user-friendly interfaces, goal-setting and problem solving features have been shown to be important features of apps in promoting physical activity26. A qualitative study of four focus groups with 19 young adults, Dennison et al27 noted that, accuracy and legitimacy, security, effort required and immediate effects on mood to be important factors that influenced app usage. The ability to record and track behavior and goals, and the ability to acquire advice and information ‘on the go’ were also important. However, context-sensing capabilities and social media features were thought to be unnecessary and off-putting. Scientifically rigorous and theoretically grounded behavior change interventions can benefit from the potential of smartphone technology (e.g. integrated accelerometers, internet connectivity, ubiquitous presence, computing power to run various applications) to provide efficient and effective tools for behavior modification with immersive and exciting experiences28. The apps used in this study did highlight some of these features, but future app development can mirror these research findings to generate fitness apps that promote its use to develop long-term sustainable behavioral change. Given its design as a pilot study, the sample sizes are small: both in the sense that only one subject performed the trials, and the number of trials per modality (n = 3). Hence the generalisability of the study findings is limited. Future studies could evaluate the findings of this pilot study, by using larger study group sizes with a focus on weight loss and behavior modification as part of a public health campaign. Further limitations include that only calories burned and METS data were used as outcomes. The groups are inherently different in regards to the aerobic versus anaerobic components of each workout. It is postulated that anaerobic exercise can increase the basal metabolic rate (BMR) for almost 24 hours post exercise, and can include other benefits such as improvements in muscle strength and muscle hypertrophy29. These effects would not have been detected in this study. Other benefits from certain workouts, such as possible improvements in balance with WiiFit exercises have not been analysed30. This could be a focus of future research to ascertain improvements in other domains with certain exercise regimens. The incidental finding of improving efficiency as the trials progressed is interesting. The author was not able to ascertain any other studies that came to similar conclusions. It could be that due to the familiarity of the exercises with repetition, the overall efficiency improved. Or perhaps, the overall fitness improved with time as the study progressed leading to better outcomes with later trials. However, this could be focus of future research, to maybe suggest that doing an activity that a participant is familiar with maybe more efficient than learning something new, at least in regards to caloric expenditure. Fitness apps are effective tools that can be utilised for physical activity: this pilot-study of one participant illustrates that they are as effective at raising caloric expenditure as other forms of traditional exercise. However, further research is required to expand on this early finding, as well as monitoring compliance and adherence of such technology. Mobile technology presents an exciting frontier for public health in tackling the obesity epidemic in the developed world, and with better scientific rigor, apps can be developed that will hopefully enable lasting behavioral change. 1. Saris W, Blair S, van Baak M, et al. How much physical activity is enough to prevent unhealthy weight gain? Outcome of the IASO 1st Stock Conference and consensus statement. Obesity Reviews 2003;4:101–14. 4. Hoad V, Somerford P, Katzenellenbogen J. High body mass index overtakes tobacco as the leading independent risk factor contributing to disease burden in Western Australia. Australian & New Zealand Journal of Public Health. 2010;34:214–5. 5. Hebden L, Balestracci K, McGeechan K, et al. ‘TXT2BFiT’ a mobile phone-based healthy lifestyle program for preventing unhealthy weight gain in young adults: study protocol for a randomized controlled trial. Trials. 2013;14:75–85. 7. Malnick S, Knobler H. The medical complications of obesity. QJM. 2006;99:565–79. 12. Trolle Y, Rossner S. Obesity management: what brings success? Therapeutic Advances in Gastroenerology. 2013;6(1):77–88. 15. Klasnja P, Pratt W. Healthcare in the pocket: mapping the space of mobile-phone health inter-ventions. Journal of Biomedical Informatics. 2012;45:184–98. 16. Pellegrini C, Duncan J, Moller A, et al. A smartphone-supported weight loss program: design of the ENGAGED randomized controlled trial. BMC Public Health. 2012;12:1041–51. 19. Fruin M, Rankin J. Validity of a multi-sensor armband in estimating rest and exercise energy expenditure. Medicine & Science in Sports & Exercise. 2004;36(6):1063–9. 20. Sieverdes J, Sui X, Hand G, et al. Cardiometabolic results from an armband-based weight loss trial. Diabetes, Metabolic Syndrome and Obesity: Targets and Therapy. 2011;4:187–94. 22. Shuger S, Barry V, Sui X, et al. Electronic feedback in a diet–and physical activity-based lifestyle intervention for weight loss: a randomized controlled trail. International Journal of Behavioural Nutrition and Physical Activity. 2011;8:41–8. 23. Welk G, McClain J, Eisenmann J, et al. 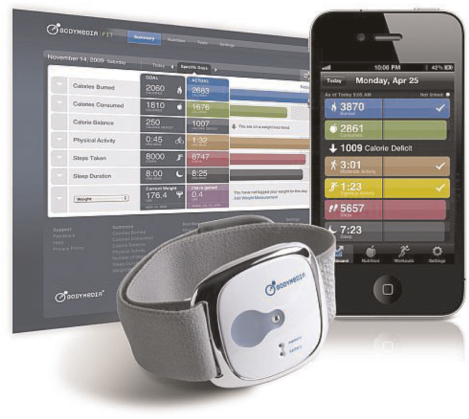 Field validation of the MTI Actigraph and Bodymedia armband monitor using the IDEEA monitor. Obesity. 2007;15(4):918–28. 24. Lombard C, Deeks A, Ball K, et al. Weight, physical activity and dietary behavior change in young mothers: short term results of the HeLP-her cluster randomized controlled trial. Nutrition Journal. 2009;8:17. 26. Robin C, Bock B. Desired features of smartphone applications promoting physical activity. Telemedicine and e-Health. 2011;17(10):801–4. 28. Fanning J, Mullen S, McAuley E. Increasing physical acitivity with mobile devices: a meta-analysis. Journal of Medical Internet Research. 2012;14(6):e161. 29. Kerksick C, Leutholtz B. Nutrient administration and resistance training. Journal of the International Society of Sports Nutrition. 2005;2:50–67.